Costs for the U.S. Navy’s most powerful destroyer keep on rising. The construction cost for the three ships of the U.S. Navy’s next generation guided missile destroyer Zumwalt-class have increased by around $450 million USNI News reports. USNI News cites data compiled by the Congressional Research Service outlining that U.S. Navy cost estimates have increased from $12.28 billion in the fiscal year 2016 budget submission to $12.73 billion in the fiscal year 2017 submission. The latest cost increase is purportedly largely due to performance issues during the construction and testing of the special Integrated Power System of the first-in-class ship USS Zumwalt at the General Dynamics Bath Iron Works (BIW). In addition, “[s]ome of the cost growth is likely due to the fallout of the since-resolved labor dispute with BIW unions who rankled at a management propsal [sic] to bring in outside workers to assist with work to complete not only the Zumwalts but also the Arleigh Burke (DDG-51) guided missile destroyers — also being built in the yard,” according to USNI News. The decision to reduce the number of destroyers from seven to three also raised the per-unit costs and “caused some class-wide procurement-rated costs that had been allocated to the fourth through seventh ships to be reallocated to the three remaining ships,” the Congressional Research Service reports. Total cost for the U.S. Navy’s most expensive destroyer program in its history is now estimated at $22.5 billion. The USS Zumwalt will be transferred to the U.S. Navy for inspection and acceptance trials this month. As I reported previously, the inspection and trials will involve the ship’s hull, as well as its mechanical and electrical systems. 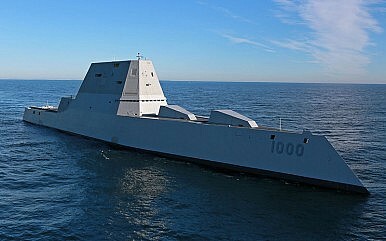 Once completed, the vessel will be transferred to San Diego, where the majority of the Zumwalt’s combat systems will be installed. The ship already conducted sea-trials in the Atlantic Ocean in December 2015. It is scheduled to achieve initial operational capability in October 2016. The future guided-missile destroyer departed Bath, Maine yesterday.